This pie is so easy to make, you can throw it together in minutes!! I enjoyed it most, after it had been in the fridge overnight. The pie takes a little while to firm up, but it is worth the wait!! Preheat oven to 350. Blend all ingredients (other than the crust) in blender. Poor into thawed crust. Bake for 45 minutes. Chill for at least 2 hours, best after 12 hours. My adult daughter stumbled across this and thought I would enjoy it. And I do! I’ve been a Vegan since March 12, 2010 and many good things came out of it…such as heartburn completely gone when I was having it every day and every night, blood pressure down to normal when it was extremely high for so many years, sleeping soundly when I had insomnia for so many years, water retention pretty much gone and I’ve had it bad since my mid twenties and bonus . . . I’ve lost, to date, 29 pounds. People look at me funny saying, “Vegan? Oh! So what do you eat, only beans?” That is so frustrating. There are so many options and it’s been pretty satisfying since I’ve changed my eating style. My family will try it but I won’t force it on them Although I do serve them certain recipes/meals and they don’t know it’s vegan, Ha!, and they liked it!! Anyway, I love Pumpkin Pie and have missed eating it!! THANK YOU for posting this recipe!! There are certain food items that I do miss but will not break MY rules. 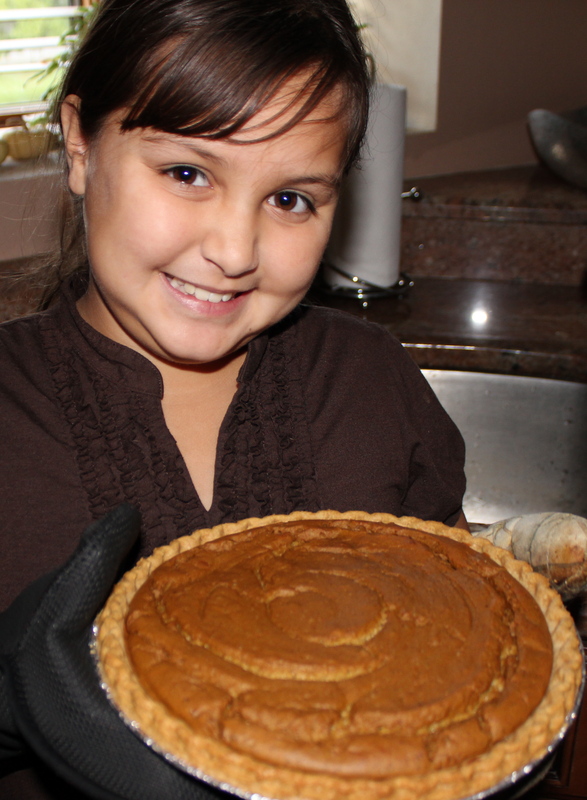 When I saw your blog, and your Pumpkin Pie recipe, I yelled out, “YES!” So Lisa, Thank you so much! Thank you for your wonderful feedback Chrissy!! I’m so happy to hear that a Vegan diet has benefitted your health!! I wish more people would be open minded about this lifestyle! Thank you for the pumpkin pie recipe. I made it for the Christmas holiday. Everyone who tried it loved it. My son and I have been vegans since May 2009. I have lost 82 lbs. so far, and that wasn’t even the reason why I became a vegan! What happens to animals in factory farms is what did it for me. Thanks again, and your website is wonderful! Very colorful and interesting! Thanks for letting me know that my recipe was a hit Karen! I’m so happy!